It started with rumors Back in 2005, then I spoke with Tony via VHF About 2 months ago and heard it had been confirmed, but I thought I should wait for SALTS´ formal announcement before I posted it here... Offshore 2007 is going where no offshore has gone before! It was really one of the only places left, having already voyaged to Europe and many times in the South Pacific. 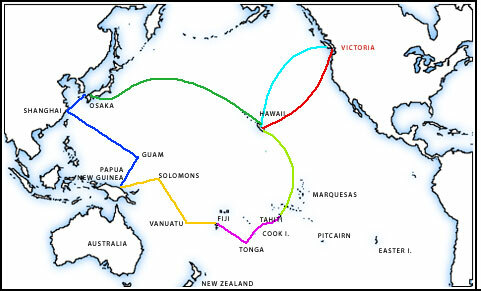 In 2007 the Pacific Grace will travel to such exotic ports as Papua New Guinea, Guam, Okinawa, Shanghai, Osaka, and Tahiti - to name a few. It is one of those things that I wish I could do - drop everything and go... but I have many amazing experiences planned here and it would only be a trade not an addition. To all those that travel Aboard the Grace we wish them well - and hopefully will, yet again, track their progress here as they visit the other half of the world!